An Instagram model from California says she’s lucky to be alive after she was attacked by a shark while swimming in the Bahamas. 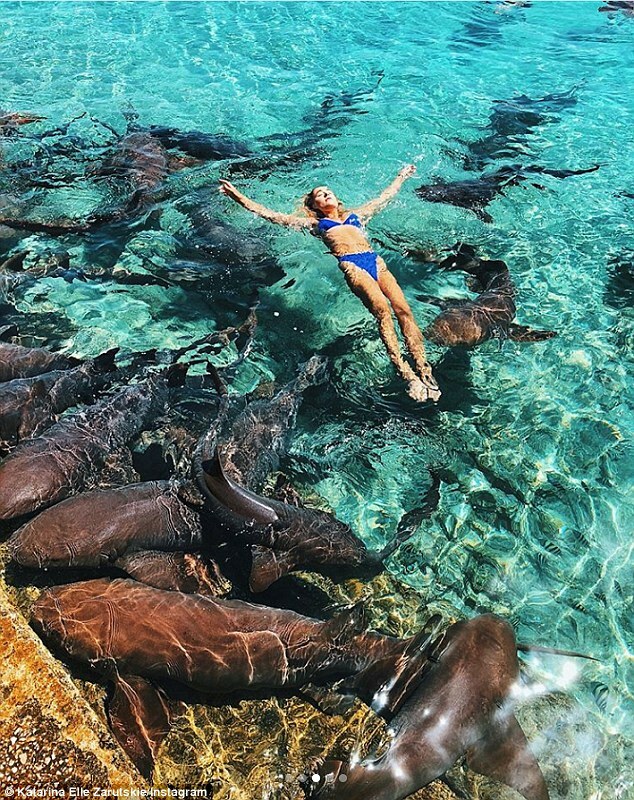 Katarina Zarutskie, a 19-year-old model and nursing student, said she had heard from locals that swimming with nurse sharks could be a fun experience so when she spotted a group of them off the coast of Staniel Cay island she jumped right into the clear blue water. 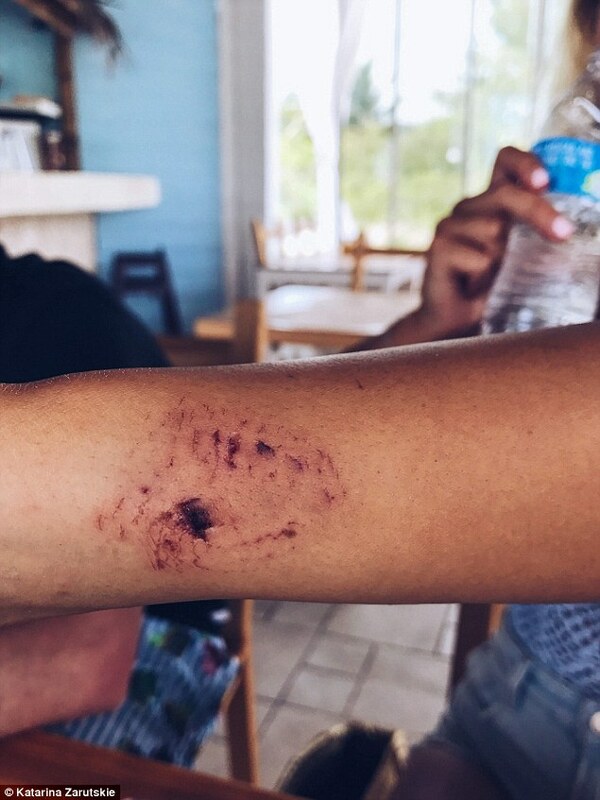 What was supposed to be a memorable adventure quickly turned dangerous when one of the sharks bit Zarutskie’s arm and dragged her under the water. ‘He had my wrist in his mouth and I could feel his teeth sinking into my arm,’ she told NBC News in an interview on Monday. Zarutskie, a student at the University of Miami, was on vacation with her boyfriend’s family when she was attacked. She said her boyfriend’s father captured the terrifying encounter on camera. In one image, the Laguna Beach native is seen wearing a blue bikini floating on her back in the water with her arms outstretched. About a dozen nurse shark are just inches away. Another photo captures the exact moment Zarutskie was attacked. 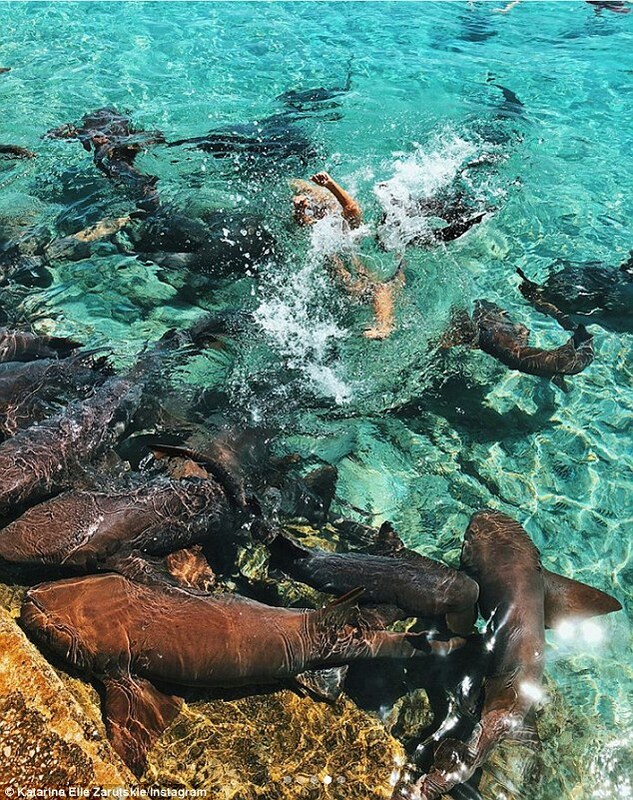 In the image, she appears to be splashing in the water as several nurse sharks surround her. A third picture shows her holding her injured arm above the water to prevent the blood from attracting more sharks as she tries to get out of the water. She shared the photos on her Instagram page with the caption: ‘PSA: Sharks DO bite’. Zarutskie told NBC that the shark she came in contact with was five-feet long. ‘I was pulled underwater for a few seconds and then ripped my wrist out of the shark’s mouth as fast as I could,’ she said. After freeing her arm from the shark’s mouth, Zarutskie said she swam to some nearby steps and climbed out of the water. She went to a local clinic to have her wound cleaned and wrapped, but said she flew to Florida for further treatment when she learned that shark bites have a high risk of getting infected. 0 Response to "Instagram Slay Queen Lucky To Be Alive After Being Attacked By Shark (Photos)"